Show the world that you can fly and dunk. Have fun playing basketball. You'll have to cut the rope, to score a slam dunk. Bonus points will help in speed, rebounds. Good luck! Try to perfect your jump and dunk the ball. Land the craziest trick shots you can to set a high score! Match your moves to the flashing icons when they turn green. See how many points you can get before time runs out. Score as many basket as you can. Starlets are looking for some fun. Up for some One on One? Well, first, you'll have to beat them at basketball. Prepare for the prettiest game of Horse you've ever played! Think you can take it to the hoop? Prove your skills and show off your jump shot in this fun basketball game. Your progress is timed, so make as many shots as possible to rack up a high score! Shoot some rockin' hoops and buy some rockin' dress. Shoot some hoops to earn money and buy of the coolest flower dresses. Make some buckets and get dress up. All in one game. You control three different street players trying to wrack up as many baskets as you can in 30 seconds. Sakuragi's practicing really hard in his free Throws. Try to put the ball into the hoop in the small time as possible in this basketball wheelchair game. Shoot some hoops to earn money and buy of the coolest teenage dresses. The objective of the player is to shoot the basketball as many as you can. This game has 10 levels and every level the movement of the basket will become faster and faster. Try to make hard basketball shots as you play against the computer trying to make harder shots. A great game that shows what a spalding ball can do. 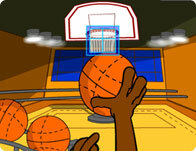 Try to shoot the ball in a moving basketball ring. Make 3 out of 5 shot attempts to win every level. Shoot as many 3 pointer basketball shots as possible within the given time. Ready for some ball? Play 21, a single match or go for the tourney win! Drop bombs from long distance, or take it to the hoop! Flash version of the old but fun slime basketball. 1 or 2 players.